After last year’s success, back by popular demand is our Scout Christmas Post! We can save you time and you can help us raise funds. 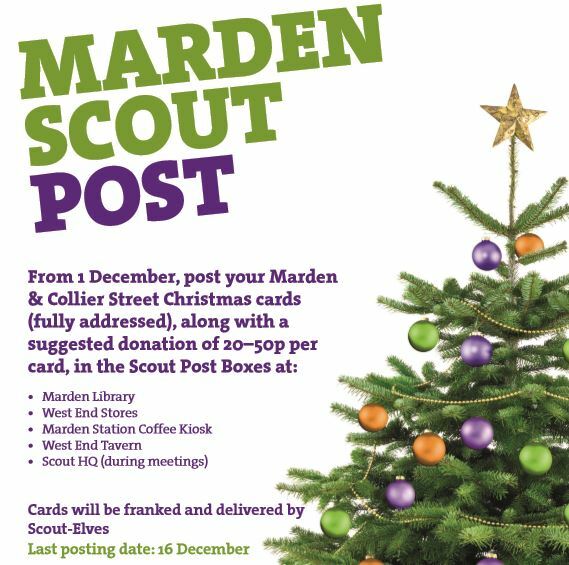 From 1st December there will be posting boxes round the village and you can post your Marden and Collier Street Christmas cards (fully addressed) along with a donation (suggested 20p – 50p). Each card will be franked and delivered throughout the village by Scout-Elves on Sunday 18th December. • Use the boxes for your village post (locations of post boxes are on the attached poster). Note there will only be one delivery so this is not suitable for regular mail, only Christmas cards. Last posting date: 16th December! • We need Beavers, Cubs and Scouts – accompanied by an adult – on Sunday 18th December to deliver cards. The Scout HQ will be open from 9 – 10:30am to collect a batch of cards and they must be delivered in daylight, the same day. We appreciate it is a busy time of year and it is the last Sunday before Christmas but the more help we get, the less each person will have to do! With big thanks to Mrs Weir for again co-ordinating this for us. We have now launched our new website and will be looking to add more content very soon. If you have any suggestions for the new site, please let us know as we want this to be as useful as possible.